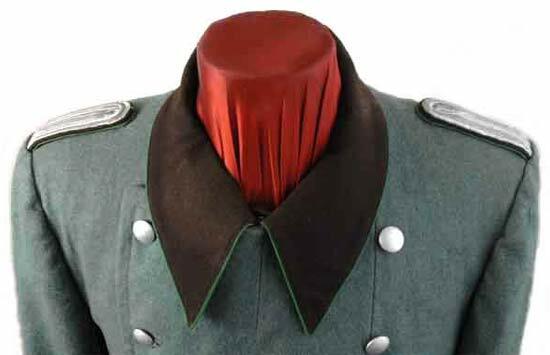 The Police Greatcoat was issued to all ranks and was very similar to the German army greatcoat. The Police were divided into eight branches of service, each one having piping of their own truppenfarbe, (service color). The color of the Schutzpolizei des Reiches, (National Protection Police) was green. This coat is made of green wool with a brown wool collar having green piping. Twelve of the fourteen buttons are marked Assmann. The collar has a one hook closure with a wool tab beneath the eye. The inside of the coat has a grey rayon lining (no maker or size markings - looks large or x-large), bottom of lining is dirty, a left vest pocket, and a dagger hanger slot that opens directly under the left side pocket flap. No signs of mothing. Light to moderate wear.